When you or a loved one have fallen ill, your biggest priority is your health and the last thing you need to be concerned about are medical bills. Receiving multiple bills for the costs needed to cover treatment, co-pays, and deductibles can feel overwhelming. Even with insurance, many Americans find themselves burdened by medical debt due to a limited stream of income. When you are so deep in debt getting rid of it seems impossible, what do you do next? Wrong pricing: Your medication or any equipment you use may have been billed incorrectly due to human error. Incorrect time: Check that the hospital billed you for the correct amount of time you or your loved one received treatment. Charges for services not rendered: These services include administered medications and blood tests. If you didn't receive treatments listed on your bill, you should dispute those charges. Failed medical services: If you were given more than one medical exam (like a blood test) because the first one failed, you should not be billed a second time. Getting billed twice: You can check the number on your bill to make sure that you were not billed for a service you already paid for. Insurance payouts: Insurance companies don't always pay what they guaranteed. Be sure to keep a record of all documentation and bills to fix any issues that may arise. How Does Medical Debt Affect My Credit? Medical debt was once regarded like any other type of debt in terms of late payments, collections, and charge-offs. This changed in 2015 when the three major credit bureaus (Experian, Equifax, and TransUnion) decided not to report medical debt until 180 days have passed (instead of the usual 30 days for any other kind of unsecured debt). This allows you to double check your bills and pay them off in a timely manner. Even so, medical debt can severely affect your credit: for example, unpaid medical debt that winds up in collections can stay on your credit report for up to seven years -- a serious problem that affects more than 14 million Americans. What Steps Can I Take To Prevent Medical Debt? Low cost and affordable health care services: The Health Resources and Services Administration (HRSA) is a government-funded organization that offers free or low-cost health care services. You can learn more information about them at the HRSA website. Free healthcare providers: Healthcare.gov has a list of free health care providers that either do not charge their patients or only charge very low fees. Some patients are even eligible for free or low-cost prescription medication. Non-profit organizations: Certain organizations like cancer clinics cater to patients with specific illnesses and can help you receive treatment without charging high fees. What Can I Do To Get Rid Of My Medical Debt? Create a payment plan: You can make a payment plan with your healthcare provider to avoid incurring fees and late payments that affect your credit report. Your original service provider might be willing to set up a payment plan to split your bill into installments or accept a settlement offer that is lower than your initial amount. If your original service provider does not accept your offer, you can try to work with the collection agency. Bear in mind that if you pay anything lower than your total amount, it will negatively impact your credit. Ask about a hardship plan: If you know you will have trouble making the requested payments, let your provider know you plan on paying everything back and ask about a hardship plan with a lower interest rate. It goes without saying that you should do your absolute best to avoid missing any payments, which could result in your debts being sold to collections and damaging your credit. Hire an auditor: If you have any concerns over the accuracy of your medical bills, you can hire an auditor to examine your bills and potentially reduce your debt amount. Consult a debt management and credit counseling program: If your medical debt is sent to collections, speak to a debt management service or a non-profit credit counselor to create a debt management plan. This forms an agreement with your creditors and reduces your unsecured medical and consumer debts. Consider debt negotiation and settlement: You might be able to negotiate a payment with the hospital using a debt relief company or on your own. A successful debt settlement means that creditors may choose to lower your debt amount or waive the late penalty fees or even the interest rate. We recommend using a debt relief company since they have leverage and know the ins and outs of the system. However, if you are interested in settling your debts on your own, check out our guide on how to settle debts on your own. Consider debt consolidation: You can use debt consolidation to combine all of your high-interest debts (which includes other unsecured non-medical debt) to one lower-interest debt which you can pay off with a single payment by using a balance-transfer credit card or a personal loan. Debt consolidation is a great option if your credit score is high enough to land you a 0% APR credit card or a low-interest rate on a personal loan. You should aim to pay off your consolidated loan in five years and remain debt-free once the loan is paid off. 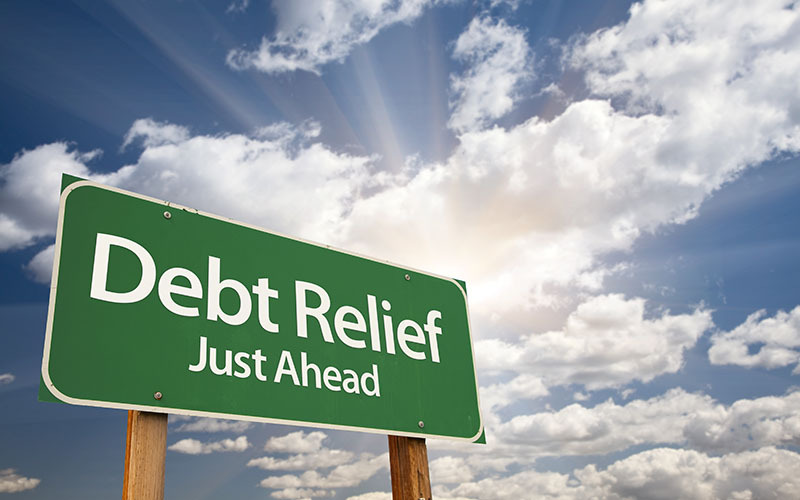 If you are interested in taking the first steps to rid yourself of debt once and for all, take a look at our top debt relief companies.